Data's communications with a doomed alien girl force Captain Picard into a moral dilemma: violate the Prime Directive, or let the girl and the rest of her species die. Riker says, "This is geology, not malevolence." Has he forgotten "Home Soil," in which a seemingly lifeless inorganic rock almost destroyed the Enterprise? By the time Data finally tells Picard about his communications with Sarjenka, it has been 8 weeks since the original transmission. That means this episode spans a period of time much longer than any previous episode. Shouldn't there be protocol for any and all transmitted communications to and from the Enterprise? Picard implies that Data has clearly done something wrong, but it is unclear if he's talking about the Prime Directive or other regulations that Data may have broken. Pulaski, in so many words, calls Worf a coward. It's amazing that she lives to see the end of the episode. 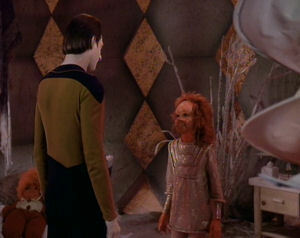 Pulaski also mentions emotions when talking about Data's relationship to Sarjenka, but Data doesn't feel emotion. It's a good thing Sarjenka has a cute little girl's voice. If it had been a rough, low, voice with a thick Brooklyn-accent and drunken slur, perhaps they wouldn't have been moved to do something. Okay, so it's been almost a season since I last talked about the Prime Directive, but this episode is all about it, so I guess it's time to revisit the subject. Despite earlier episodes ("Justice," "Angel One," and "Symbiosis") in which the Prime Directive doesn't seem to bar communications with--or even visits to--pre-warp societies, Picard starts wringing his hands here just because Data initiated a correspondence with Sarjenka. The writers have clearly modified their take on the Prime Directive, and it's starting to feel more coherent. The philosophical discussions the crew has about it are a big step forward for clarifying the show's mythology. I love the back and forth between Riker and Picard about where they are, up to the neck and up to the top of the head. It's a nice bit of interplay, showing a more familiar relationship between them. They solve the planet's techtonic instability by shattering the dilithium crystals that are pushing on the plates. Theoretically, I can see how this would reduce the instability, but once you shatter the layer of crystals under the surface, wouldn't there be an intensely violent moment when the plates settle? Sarjenka's long fingers are creepy. Picard's panic attack over having a child on the bridge is awesome. Pulaski justifies deleting Sarjenka's memory by saying that "she has to be the person she was born to be," but this seems in conflict with her rationalization for violating the Prime Directive, which was that humanity is part of the cosmic plan too. If it is destined that humanity intervene, why would Sarjenka having memories of it go against that destiny? Wesley's very first experience with command has him complicit with a violation of Federation's highest law. What happens when the aliens figure out what happened to their planet? I like this episode a lot, in that it addresses inconsistencies with how the Prime Directive is treated. However, I feel like we needed to see more of the relationship between Data and Sarjenka in order for it to be emotionally poignant. I do like how there's a consistent theme between the main story and the side story (Wesley learning about the "burden of command"), and the characters are treated very well. Still, as with Justice, I don't understand why Picard and the entire Enterprise crew isn't court-martialled for their actions. This is the first time, but certainly not the last, that Picard shows off his equestrian skills. As we see in Star Trek: Generations, it's one thing he shares with Captain Picard. Picard says, "Ah, Hell." Add this to the naughty words he's said in French, and you have a pretty blue record. I don't remember Picard being so foul-mouthed.